Learn how to develop Weak Hand/Foot Skill Development in other sports! How can you use it in basketball too! Last week, I came across an weak hand – foot skill development article that peaked my interest as soon as I read the title: Why AFC Wimbledon’s Academy wear odd socks. The soccer article began to talk about how “AFC Wimbledon’s youngsters aren’t allowed to wear matching socks until they can use their weaker foot to a competent level”. They think that professional footballers aren’t very good technically with their weak foot. Most youth development clubs miss out on a trick in this particular area of the player’s skill development. Often in sports, the difference between being good enough to play at the next level is very slim. The smallest things can make the difference. The most important skill development ideas are to get your players to work on their weak foot at a competent level where they have the technical knowledge to make the right decisions at the perfect time. So why the two color socks? Wearing different color socks highlights the difference between healthy foot (competent) and weak foot (not skilled). The players who have not “graduated” from the two color sock system, wear two different color socks at all training sessions and matches. They realize that the strategy is to develop the weaker foot skill development, but they also understand that it helps coaches to see opportunities and players can’t hide from it. 1. It is a bit of a shaming exercise. Competitive players will recognize their lack of skill with the weak foot and work hard towards reaching proficiency with both feet. It gives them a goal that they work hard to achieve. 2. In general, it didn’t decrease confidence but increased. It takes their fear away as they do not need to hide their weakness. All players are in the same situation and progress is positively reinforced. 3. It raises awareness of what needs to be worked on and helps coaches recognize opportunities to develop a player’s skill set. So it got me thinking about the applicability to basketball, as we are also a sport that uses both feet and both hands (as opposed to many other sports that only develop a dominant hand). I am not sure that the idea of wearing two different color socks would work? And what would they wear to highlight the weak hand? But I believe that the general idea can be applied. Too many players in basketball are not proficient in using both feet and hands, from youth to professional. Coaches today need to spend more time on skills developing both. Why do we expect kids to use both hands when shooting lay-ins, dribbling, or passing, but not expect them to be able to pivot or make an attacking move using both feet? More time needs to be spent on developing the whole player. Perhaps instead of spending all our time just working on the dominant hand or splitting time between strong and weak, take a chance to focus on the weak hand/foot solely? It will be difficult. It will be ugly at first. Many players may fight it. But proficiency with both may be the difference in achieving that next level. 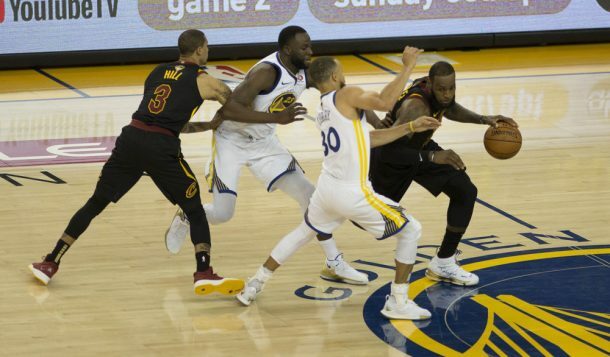 Basketball is a game that is played with both left and right, so why should we (and players) limit it to just use of one of them?